Alex Bacon: Can you talk about your evolution into abstraction? 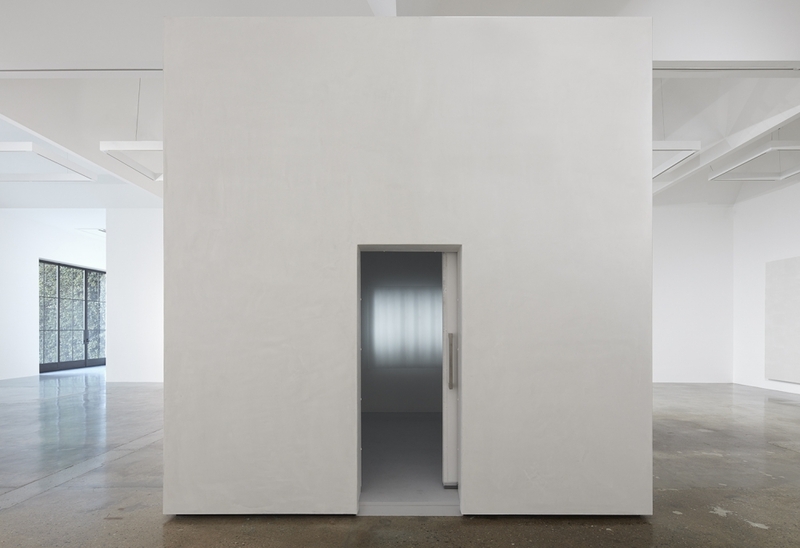 Mary Corse: I came to abstraction early on, because I had a very good situation with my education. I was lucky, or it was my destiny. I had always painted and drawn since I was little. But then I went to this private school in Berkeley for the seventh, eighth, and ninth grades. I had three hours a day of art with a teacher who had gone to Chouinard in Los Angeles, which was the best art school at the time. There were only three of us in the class. There I got an early dose of Willem de Kooning, Hans Hofmann, and Josef Albers, tracing images of their work. I gravitated towards that kind of work, and especially Albers and Hofmann, because early on I was already fascinated by the perceptual—having perception in there, in the work. How you look at an Albers and something happens, I wanted the painting to do something. Also, with Hofmann, things are going back and forth. I was amazed at what you could do with pictorial tools: create space, go this way, that way, and with color; how Albers would make things appear and disappear, and totally change before your eyes. My teacher had the big Albers book, Interaction of Color. So I got it from there. We would stare at the plates and watch the color change. AB: So you were seeing all these works in books? MC: Yes, in books, and we wrote papers. But we painted a lot, too. I still have a couple of those paintings, which show my de Kooning influence. What’s weird, in some of them, it’s a still life, but there’s a lot of color, and in the center there’s this glowing white cup. AB: Light has always been of interest to you. MC: Yes, it was already there! I was painting it. AB: This early collage, made when you were only 15, displays push-pull à la Hofmann. MC: All of these marks are deliberate. I was creating space. AB: It’s significant that that’s an interest that’s continued: making space. MC: That’s why I’m mentioning it. Because after that influence I started getting more and more reductive, wanting to get rid of everything unnecessary. From then on, I went my own way. But these issues—creating space, creating color phenomena—still stay with me, especially in the white paintings, which have the inner bands that appear and disappear. I was probably influenced way back then that the painting should change. I never was interested in a painting being a static object, because for one thing, there’s nothing static in the universe. So why would a painting be? AB: And the mural in this photograph, it was done very early on? MC: Yeah, I was a kid. You know what this is? Well, I’m sitting on the stove. And this is on the ceiling. I painted it so that it looks flat. This is the end of my Abstract Expressionist phase [laughs]. AB: You said you were also involved with music at a young age. MC: Oh yes, I started piano lessons at five. Classical piano. I liked Bach and Bartok best, and then about twelve I went on to jazz. I also did ballet from the same time, and by fifteen I was performing with the Oakland Ballet. There was a break before I really started making art again around age eighteen. But painting was always my main thing. It was maybe an escape from having to do the music and the dance. I would go inside myself to get away. I painted for my sanity. 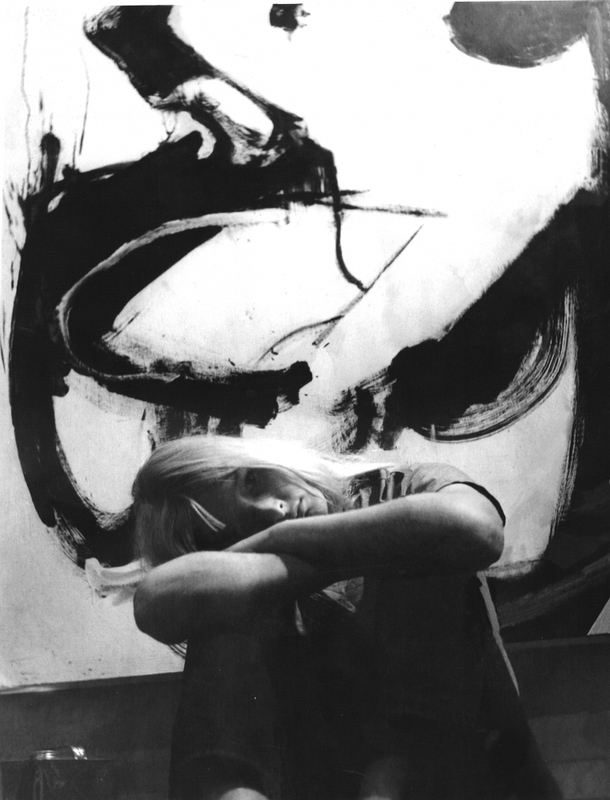 AB: When did you first see the works of artists like de Kooning and Hofmann in person? MC: Much later. Because I was in Berkeley and there wasn’t any art there then. It was before the Berkeley Art Museum. AB: What do you remember seeing in the flesh early on? MC: I hadn’t seen a lot of art. When I was young I thought all the real artists were dead. I remember seeing Clyfford Still early, I think. But not much really, not until I went to Europe when I was eighteen. Then I went to the museums and saw real Cézanne, Manet, Monet paintings, etc. But I wasn’t seeing Abstract Expressionism so much in person at this point. AB: Were you already working in a pared down, reduced way? MC: Oh yes. I was getting more pared down. 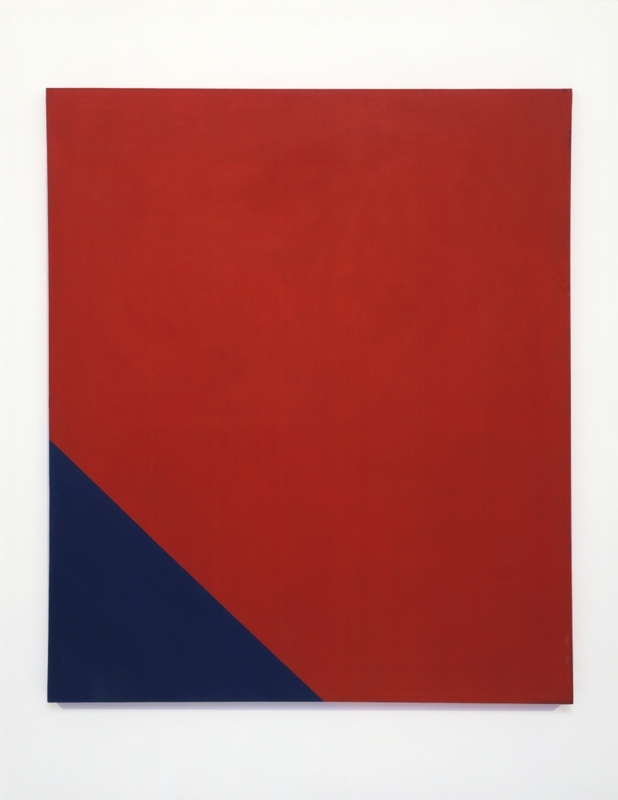 There was an important red and blue painting I did in 1964. AB: That painting was very significant to your development. MC: Yes, that painting is what made me really think about the light. Noticing how light seemed to flash along the meeting point between the red and blue passages, after that I consciously tried to put the light in the painting. That was before I even made the light boxes. I was shaping my paintings, really trying to make them autonomous objects. The first one I did was a blue octagonal and I put speckled silver in it. I was trying to put the light in the blue. AB: By that you mean that the painting itself is generating the light, not a representation of light or shading, but physically reflecting the light source from inside itself? MC: Right. The light in the painting is in the media I use. So I tried it with that metal, not that aware of what I was doing, and I think that’s when the white came in, because next I did a white octagonal, and then it did turn into actual light. The white octagonal and hexagonal shaped canvases also have the inner band down the center. There’s one that’s indented and one that isn’t, but the indented one is the one I now realize was a precursor to the inner band. I painted everything else but the line, so it was indented because the paint levels were different. When you look from the side it disappears too. AB: It’s amazing that you hit on the monochrome, the shaped canvas, and using unconventional materials like the silver flakes. That’s a lot of things to arrive at in 1964, which was right when other artists on both coasts were also doing so, even though you weren’t aware of them at the time. MC: Well, see, I wasn’t making comparisons based on what’s radical or what’s not radical. I was simply doing the next thing that the painting needed to go in the direction I wanted it to. But no, I didn’t see it at the time, I only knew about Frank Stella later, and his shapes were very different from mine. Though, like his, mine were about bringing out the objectness of the painting more. Even a little bit later, when I started using the glass beads, I made the canvases thick, so that they stood off of the wall. The object was still a concern, even as I was pushing the question of luminosity as well. Each painting is a step. 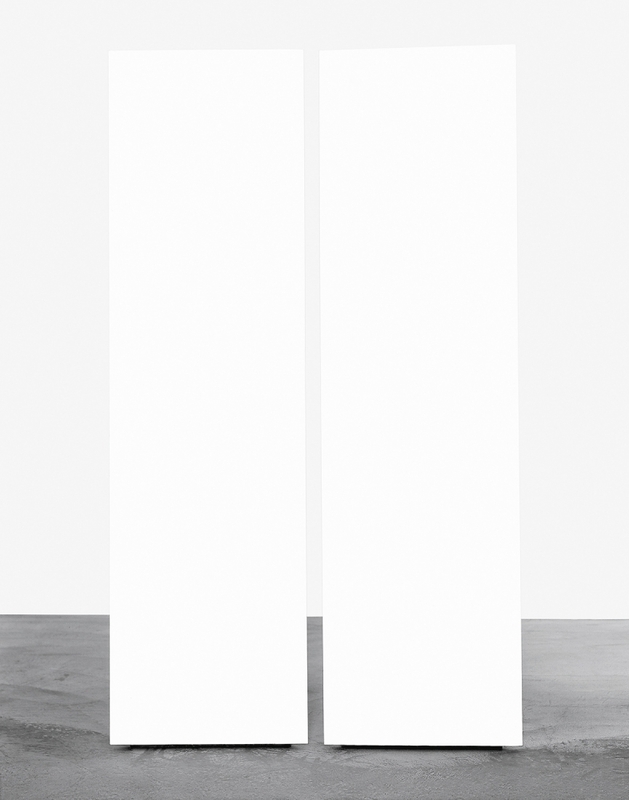 First, in 1964, it was the shaped canvas, which became the columns a year later—the same shape in three dimensions. See that space between them? I was already working on what I now call the inner band, the band that appears and disappears as you move around the piece. The first inner band, I discovered it in painting the arch form, a motif that I began using around 1990 with no inner band, and then in 1996 I painted the first arch with an inner band, but it took me a few more years, till 1999, to finally recognize it for what it was. I’ll never forget it. I was doing an eight-foot-square white arch painting and I was trying to paint under the arch form in a certain way. Then all of a sudden I realized “Oh, just do this.” What it was the inner band, and I was laughing, because it worked so well. That was the beginning of me consciously painting the inner band. AB: What was the next step after the columns? MC: I went back to the wall, but I made these wood boxes that were painted white, with plexi in front and on the sides. I sanded all the brushstrokes out of those. I wanted to get rid of any trace of subjectivity, but it was a form in space because the plexi came out in front of the painted surface. There were three of them and they varied in terms of the depth of the plexi. AB: I’m curious about that transitional stage, what made you think to put a plastic box around the painting? MC: It was to create space. Actual literal space, not pictorial space. AB: In the light boxes, what kind of gas is going through these tubes? MC: It’s a glass tube with argon in it, though at first they were fluorescents. I had the electrodes taken off. It isn’t easy to find someone who will do that. AB: What does that do? MC: To get rid of the wires and get it to float free from the wall, and it worked. I lit them with an electrical field—with a Tesla coil, a high-frequency generator. AB: You can see the ghosts of bands of light. MC: Right. They’re there, but subtly. AB: You don’t want people to recognize the machinery? MC: Well in some, like the big one, it was a completely even, solid light. But in the wireless light pieces there’s some flickering, there are some very subtle bands, and a little bit of sound. Later, I started doing band paintings. Somehow those bands are there early, even though I didn’t think of it that way at the time. AB: So they change like your other works? MC: Well these earlier ones didn’t really change in the same way as the others. And here the viewer is still outside the object, but in the paintings, when I put in the light and the brushstroke, the viewer’s position and movement actually creates the painting. So the viewer becomes part of the work, the light is in the painting, that’s where perception had to get in—to be a kind of realism. I actually did still call these light paintings. 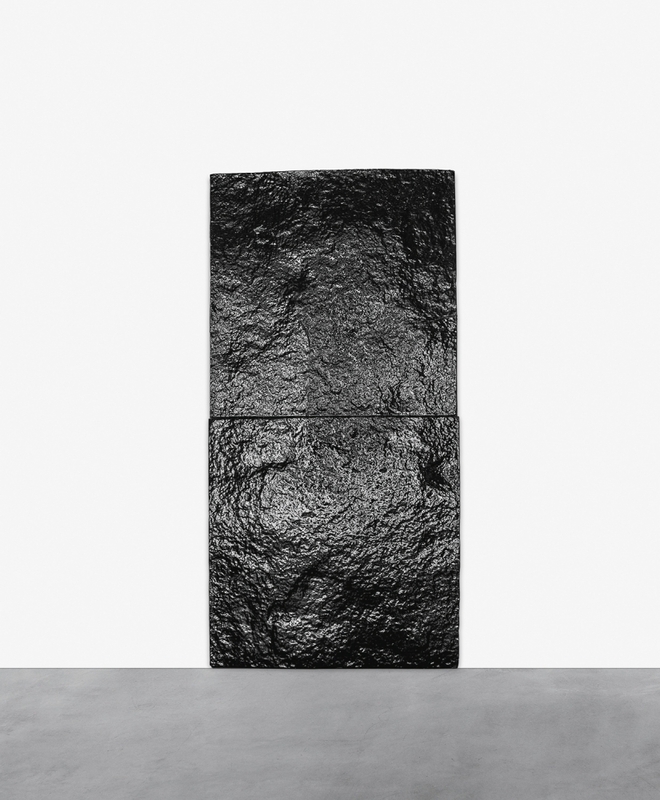 And even my black ceramic pieces, I call Black Earth paintings, because it’s more about the concept, the idea of painting: the flatness, even though they’re objects as well. AB: Why was it so important that they be paintings versus sculptures? MC: Painting is a more abstract medium. It has one less dimension. For me, that flat two-dimension is one less dimension than the three dimensions of most objects, and then later when I added that band that’s inside the two dimensions, it is totally abstract, because it doesn’t exist, except in perception. So that was an important thing, I realize now as we’re talking about my work, this question of flatness has always been an issue for me, even in the early light pieces. AB: So they started on the wall, and then moved off of it. What did that do for you while still being a painting? MC: I was trying to bring the flat out. I was trying to bring it off the wall; it led to these light boxes. See I had already done this with my earlier shaped canvasses, which were dealing with shape, and then those led to the columns, which were off the wall. I was trying to make it its own. AB: It seems important that they’re mirrored, symmetrical front to back. It’s a doubling of the flat plane. It’s also interesting that it’s continuous from front to back, you essentially have the same experience as you walk around the piece. MC: Plus the light it casts reflects on the wall too. AB: Tell me about the giant kiln you built to make the Black Earth pieces. MC: It was here until I built the studio. We tore it down just a couple years ago. I didn’t imagine doing them anymore. You see how the light reflects? It dematerializes the earth. I didn’t want anything of the artist’s ego. AB: How does it happen that it has this surface? MC: Well I went up in the mountains, and molded it off of a rock. I didn’t want anything of my hand or composition. So I went way up in the mountains, and made a big plaster mold. It was quite difficult to find a flat enough rock, most were too bumpy. It’s too hard to fire if it’s bumpy, for one thing. AB: It does have a bit of a raised surface. These pieces are very physical. MC: They’re supposed to be. AB: So you still wanted to play with light, even though it’s a different medium? MC: Right. I think how I came to this, is that for ten years I only painted white paintings. I was very much into ethereal metaphysics, and I guess I needed to ground myself. I have a body, we’re on the earth, and the smallest painting I was making at that time was eight-feet-square and white, so I thought, why not an eight-foot-square black earth? So I designed this kiln to make an eight-foot tile. The kiln builders told me it would never work. You need seventy burners under the floor. But there was this old Chinese method, where you could bring it in and spin it around under the floor, and it went up around the sides, and they worked like a dream. I also did some ceramic pieces with luster, which is what they use on certain kinds of teacups. I put it on these big surfaces. I could even fire that, which was really delicate. It was quite an amazing kiln. I never was interested in a painting being a static object, because for one thing, there’s nothing static in the universe. So why would a painting be? Installed: 11’ 11” x 11' 3" x 11' 3"
AB: How did that manifest in the direction your work took? Because soon after that you stopped making the light boxes, right? MC: That’s when I realized more and more that perception has to do with how we perceive reality. I got that from the physics class. Like with the Heisenberg principle, where you can’t watch the wave and the particle at the same time, and so uncertainty comes in. I got it on a more broad, philosophical level. Physics, like I say, has become metaphysics. It really has. AB: Today certainly people talk about string theory, alternate dimensions, etc. Were you ever engaged with meditation or studying Eastern thought? MC: I’ve always been interested in the unseen side of us. I’ve looked into a lot of things: I Ching, tarot cards, astrology, etc. What I found to be the most meaningful was Tibetan Buddhism. I was into Buddhism early in the 1960s, even before the physics class, which maybe confirmed what I was already thinking. Physics is about what things are. That it’s ambiguous, nobody knows anything, it’s all uncertain. Buddhism teaches us how to live in that kind of world. I’ve learned a lot from that approach. I think minimalism in art in a way was trying to shut everything out. Even though at one time my paintings looked minimal, because sometimes there’s hardly anything there, in terms of what we expect to see in a painting—content, composition, color, etc. But then they also changed, even if it’s not readily apparent, because it’s more about letting everything in. AB: Back when you showed at the Guggenheim in 1971 as part of the Theodoron Awards, you had a very specific idea about the lighting the paintings should be shown in. MC: What was important was the angle of the lamps, and that they lit the paintings as a solid field. When you do a show, you want to see all the possibilities, and lit as a single field is one possibility. But if there’s more time, then things change and you want to try out other options. I used to be more specific about the lighting, but I’m not anymore. AB: Those paintings shown at the Guggenheim had glass beads, except for unpainted squares in the four corners. MC: That had to do with creating a form. It creates a tension through the whole surface and pulls it together somewhat. And that’s why, slightly later, I had to make a beveled painting. With those squares in the corners I couldn’t have a side like a traditional painting does. Because then, when you moved from the front to the side, the square would become an L-shape. So that’s what led me to bevel my stretchers, so that the field ended definitively at the edge. AB: Because you wanted it to be flat. MC: Very flat. Two-dimensional. Yes, and off the wall, sort of floating. Then later after that, I left the bevel and returned to conventional stretchers when I introduced the bands, so that the form continued around the sides. At that time I wasn’t that clear about my interests in the totally two-dimensional, probably. And then when I got it, I went back to beveling the stretcher. Now everything is beveled again. AB: How do you approach the role of the brushstrokes in your paintings? Is the brushstroke a way in for the viewer? Is it an indication of the handmade aspect of the work? MC: Sometimes it’s more, sometimes it’s less. Sometimes they’re more gestural, sometimes they’re more regular. After sanding out all the brushstrokes in the ’60s, then when I was able to realize that you can’t get rid of subjectivity, and that’s why I put the brushstroke and the human touch back in. AB: Can you speak to the role of scale in your work? MC: Works of different scales relate to the body differently. I like to see different configurations and sizes and see how they feel. Some of them work big and work small, some of them don’t. I like making bigger paintings. For one thing, if a painting is twenty-feet long this introduces the element of time. If the painting is very long, it takes time to take it all in. With my work, which changes as you walk around it, what one person sees from one side is different from what another person sees from the other. The art is not on the wall, it’s in the viewer’s perception. AB: You had ideas for installations back in the 1960s, though you didn’t have a chance to realize them back then. Can you discuss the one you will realize for the first time a few months after this conversation, in your first solo exhibition at Kayne Griffin Corcoran? MC: It’s called The Cold Room. It’s a cold room, and inside it is hanging one of my early wireless flat screens, one of the early white-light Plexiglas pieces. Just one of those in a ten-foot-square room painted white. The reason it’s cold is that cold heightens your consciousness. I wanted the experience of being woken up a little for the white light. AB: How cold will it be? MC: We’re at around thirty-five degrees Fahrenheit. So not so cold, but the viewer will have a jacket on. We’ve tested the temperature and its effects by visiting the kinds of large refrigerated rooms restaurants store food in. AB: Did you have any other ideas back then for installations? 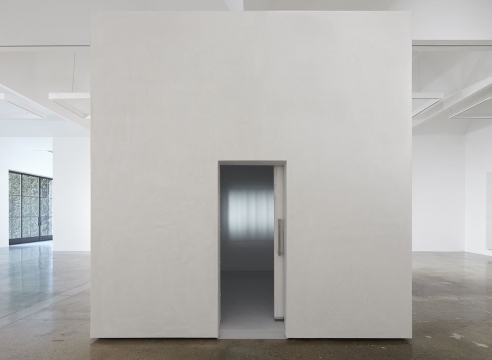 MC: There was a room I wanted to do, about the size of my studio, and in the center there would be a light cube sitting on a Plexiglas stand, so that it was free-floating. It would probably have to be a cement room. Then one wire through the whole wall could work as an antenna, it would light the whole thing. But it’s not quite as easy as it sounds. I definitely didn’t have the means back then to realize it. But there were also technical issues to figure out. Like how strong does that Tesla coil have to be to light that far away, and walking in between the Tesla coil would be dangerous for the viewer. AB: Talking about these ambitious interior installations makes me wonder whether you’ve ever thought about doing the opposite, creating work meant to be outdoors. MC: Yes. I just recently did what I call a “nighttime” piece. This one is four White Light bands, fifteen by six feet each, on a sixty-foot exterior wall. The whole painting lights up with a very small light source. I also want to do them freestanding on thin metal panels. I have an idea that a row of those could be lined up out in the desert, say along a road where a car could light them up while driving by. AB: How did you arrive at using glass beads? MC: I wanted to put the light in the painting. So I was trying to figure out how. I already mentioned that in 1964 I tried silver flakes in a blue octagonal painting. Then I tried Murano paint, which changes hue as you move around it. I was looking around, trying this and that. Then one day I was driving down the road, and the light was hitting from behind, the white lines in the road lit up, and I thought, “Oh, I’ll try that!” And it worked. The highway safety spheres did what I wanted. I had to go find and test them. I go to a special place where they handle them. They come in big fifty-pound bags. AB: How do you put them into the paintings? MC: When I paint the paintings the canvas is flat on the floor and I’m on a board that has wheels. My assistant is holding me from behind with two ropes. The last layer is so difficult, and the paint dries fast, and each brushstroke is so difficult to make. Compared to early on, when all the layers are easy, because you paint and sand. But then this last layer I throw the glass beads on. It’s very physical, I have to pay attention. Sometimes the paintings are twenty-feet long. You’re doing that as fast as you can for a few hours. When you start you can’t stop. AB: I’m struck by all the different light refractions that happen when viewing one of your glass bead paintings. MC: That’s what it is, refraction. It becomes a triangle between the surface, the viewer, and the light. I wanted light and movement. I knew I wanted it to change. AB: What moved you out of working only in white? MC: The Black Earth paintings. After I did white, then I went to black. I didn’t really use color until I had the glass beads, and then I could make color be the light. Something about color bothered me, because color was light, and so I started using color when I could put it in with the glass beads, cause that put the light in the color, and it was truer than just painting a picture of color. AB: And white is also all light. MC: Yes, all the colors are in white light. And I was also interested, and I had the idea, going deeper into white light, you’re going to find color. I always liked moving deeper inward. And so going deeper into white light also all of a sudden gives you color. AB: You have had a lot of consistency in your career, despite evolving. MC: My practice keeps growing. It’s a growing thing, and, again, it’s like a conversation with what I call the abstract entity through the painting I’m painting. A painting can be a pathway to our source. The painting starts talking to you, saying, “a little bit more here, a little less there. Get rid of that. Put that there.” So it becomes a conversation in that way. Think of numbers. Writing an equation you have a conversation with some abstract entity, the meaning of which comes through numbers. You can ask questions and get answers, a lot like painting. For me, a work enters the realm of art when it makes me feel and know the reality of my human state in its essence—an abstract perceptual experience beyond thought. I’m interested in a painting that is about itself, that is not political, not a cartoon, nothing interesting—just a pure perceptual experience of the moment, the experience before the idea. Not limited, finite thinking but rather an alignment with the infinite, the bigger picture—less thinking, more being.